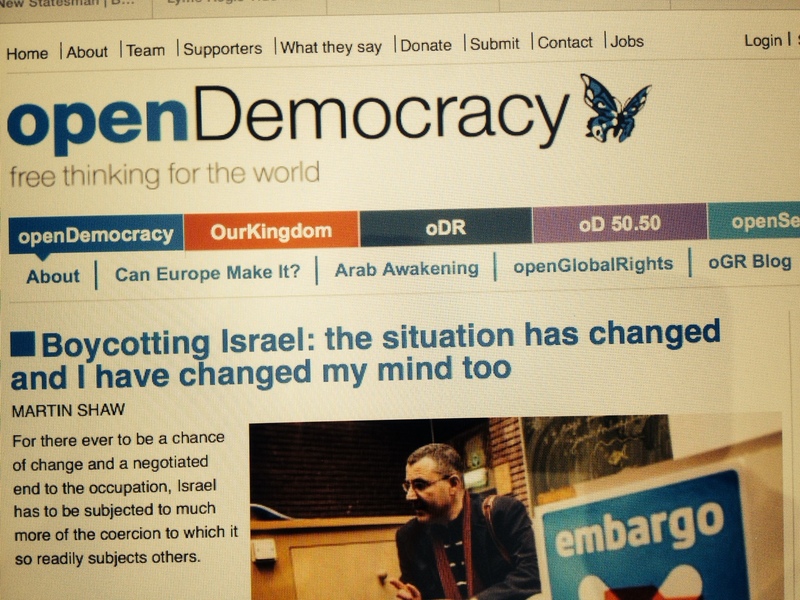 My new article published on openDemocracy. Some additional comments, not in the openDemocracy version, are indicated by italics. Israel’s slaughter in Gaza must make us all pause and ask whether we should rethink our stance on the Palestine conflict. The killing is presented as a regrettable response to Hamas’s provocations, an almost routine police action as the Israeli euphemism “mowing the lawn” suggests. However the very fact that this is regarded as normal means that we are dealing with a highly abnormal situation, which demands a radical response. Moreover this crisis is the continuation of a larger conflict in which Israel cannot generally evoke self-defence. Its violence is not defending it against illegal aggression; instead Israel is enforcing illegal occupation of Palestinian territory, and Palestinian resistance is justified in principle. Israel has withdrawn its settlers from Gaza, but retains overall economic and military control and imposes a cruel blockade. In the rest of the Palestinian Territories, in the West Bank, Israel retains direct control and has promoted massive illegal settlement. It is clear that the larger air, sea and ground attacks on Gaza are illegitimate because they are utterly disproportionate to the requirements of ending the rocket threat. Moreover Israel is obliged by international law to take precautions to protect civilians from the force it claims to direct at Hamas. Any precautions it has taken are obviously completely inadequate. In reality the careless targeting of homes, hospitals and schools and the relentless, murderous destruction of neighbourhoods compellingly suggest that civilian harm is completely intended by the Israeli government. This violence is effectively targeted at Gaza’s civilians as well as Hamas. In the light of the pre-existing blockade directed at Gaza’s population over many years, Israel’s violence can only be interpreted as an extreme continuation of collective punishment. In the face of this horror, we all have a duty of solidarity with the victims. In the short term, that means pressurising, and getting our governments to pressurise, Israel to stop the bombing. However it is obvious, after this third assault in six years, that we must act now to stop a fourth and a fifth. This means working towards a political solution to the occupation and the blockade of Gaza. South Africa never bombed black areas to smithereens, and the Sharpeville massacre in 1961 (with sixty-nine deaths) pales compared to what Israel is doing to Gaza. Opponents of boycotts and sanctions like the late Norman Geras, a respected Marxist academic, argue that they “single out” Israel when other states are doing far worse things. In the region today, Syria has killed many more, and Egypt’s new regime too, its total soon to be boosted by mass death penalties. Yet the South African boycott, which Norman supported, also singled out one regime, by no means the most murderous of its day. In 1961 Mao Zedong was completing the “great leap forward”, which caused tens of millions of deaths, but there were no calls for sanctions against China from those who targeted apartheid after Sharpeville. Boycott advocates counter, in any case, that supporters of Israel also single it out, justifying exceptional levels of western political, financial and military support. Clearly it would be strange to rule out boycotts and sanctions from the Israel-Palestine conflict in principle, because Israel is itself applying comprehensive sanctions to Gaza. The real question about such measures is not whether we are applying them to all bad regimes equally, but whether they are likely to help move the political situation forward in the particular case. There are good reasons why boycotts and sanctions seem an unusually attractive weapon against Israel. Its dependence on support from the United States and other western states means that opposition to Israel in these societies could also have exceptional political consequences. (It is perverse of Chomsky to argue that there are weak prospects of success.) Although it remains difficult to imagine official sanctions by governments, even of the limited kind taken against Putin’s Russia, Israel’s dependence means that unofficial boycotts, on a sufficient scale, might have an unusual political effect, maybe even more than they did in South Africa. The difficulty of the effects of severe sanctions, raised by the blockade which has impoverished Gaza (and by sanctions against Iraq in the 1990s), do not appear likely to apply in the Israeli case. A rich western society can surely withstand considerable economic and other pressure without its fabric crumbling or its people being deprived of life-saving medicines. A society that so overwhelmingly supports such severe sanctions against others cannot complain about the more limited sanctions and boycotts that its opponents might mobilise against it. In earlier discussions, I did not support a general boycott of Israel (although I boycotted goods from illegal settlements). This was not because I was impressed by prominent pro-Israeli arguments, for example that boycotts of Israel evoke boycotts of Jewish shops in Nazi Germany. Boycotters almost always distinguish clearly between Israeli businesses and institutions and Jewish businesses and institutions in general. Indeed boycotters, like western critics of Israel generally, usually distinguish much more carefully between Israelis and Jews than do supporters of Israel. The latter’s identification of Israel with the world Jewish community almost invites a new kind of anti-Semitism, but western opponents of Israel are mostly scrupulous in avoiding this. For these reasons, I previously defended boycotters while opposing boycotts. My reluctance to support the latter had much to do with some of the forms they took. I was repelled by the notorious removal of individual academics from editorial boards, simply because they were Israeli. I remain opposed to any boycott of individual contacts on account of nationality, and believe it is important to maintain individual communications. Indeed it is crucial that direct support is given to courageous Israeli individuals and groups who oppose war and occupation. In due course I discovered, of course, that this is the mainstream position of the boycott, disinvestment and sanctions movement (BDS). I was also suspicious of the logic of collective punishment involved in ostracising Israeli institutions. As an academic, I valued academic discourse and although I knew that Israeli universities were implicated in injustices against Palestinians, they were also disproportionately centres of debate and even opposition. I worried that blanket academic boycotts could weaken these. Similar arguments applied to the media, which contain some important bastions of free discussion. However the decisive reason for not supporting boycotts and sanctions was that there always seemed some prospect, however tenuous, of negotiations leading to a settlement. Even if this was bound to be largely on Israeli terms, it seemed important to me (as it did to many Palestinians) to pursue the prospect. Even an unequal peace could open up cooperation based on common economic interests (Israel-Palestine is the size of Greater Los Angeles, as Bernard Avishai points out) and in the long run enable Palestinians to improve their situation. So I thought it important to avoid doing anything that might make it more difficult, and worried that this could be the result of a large-scale boycott. There were always counter-arguments. Given the inequality between Israel and the Palestinians, external pressure could help even up the balance of forces and so lead to a marginally more just settlement. Peaceful global boycotts could encourage peaceful forces inside Palestine at the expense of the armed militancy which feeds Israeli militarism. Perhaps I didn’t give enough weight to these claims. What convinces me of them now is that the pro-dialogue forces in Israel have never been weaker. Not only do almost all Israelis (87% in one poll) support their government’s current slaughter, but also the anti-war movement is the smallest of all Israel’s wars. Most important, the real negotiation between Israeli and Palestinian leaders that took place in the days of Ehud Olmert appears to have been definitively cast aside. For many years Israel’s settlement policies have constantly diminished what little chance there was of a viable Palestinian state. Settlers steal Palestinian land and homes, aided and abetted by Israeli law, bureaucracy and armed force. The “security” wall divides Palestinian communities. Army, police and settlers harass Palestinian families and the state fails to protect them from settler violence. State and municipal policies whittle away the Palestinian presence in East Jerusalem. However Israeli leaders have kept the increasing fiction of a two-state solution alive and allowed John Kerry to shuttle too and fro in ever-more hopeless diplomacy. The US connived with this by never putting sharp pressure on Israel. Binyamin Netanyahu never really supported a two-state solution and his coalition’s centre of gravity reflects the ever-strengthening pro-settler right, even as it includes some “moderates” like Tipi Livni. The exploitation of the teenage murders first to terrorise the West Bank and then shatter Gaza has made it clear that Israel has no interest in peace. Therefore Israel is dominated by forces which are wholly committed to maintaining control over the Palestinians and their territories. It is difficult to see a constellation of forces emerging which will change this any time soon – except possibly in the direction of yet more radical assaults on Palestinians, maybe within Israel proper. The attack on Gaza appears as a final confirmation of the direction in which Israel has been travelling for a long time. In this context, my reticence about the boycott is as futile as Kerry’s willingness to continue shuttle diplomacy. Moreover, the distinction between boycotting Israel and boycotting settlements is meaningless since the state has committed itself totally to settlements, settlers and all that their growing dominance in the West Bank means for the possibility of a Palestinian state. Boycott, an unavoidable political choice? In this situation, for there ever to be a chance of change and a negotiated end to the occupation, Israel has to be subjected to much more of the coercion to which it so readily subjects others. This coercion can come in two forms. One is the violence of Hamas and others: indeed it is important to note that analysts increasingly emphasise that destroying Hamas will only open up the way for “more extreme” forces. The other is peaceful pressure, in the forms of civil protest inside Palestine, a boycott in western and global civil society, and sanctions by any governments on which civil society can exert sufficient pressure to act. In the last decade, a vicious cycle of violence has helped close down civil protest and reinforce the relentless pro-settler, anti-two-state dynamic of Israeli politics as well as Hamas’s dominance in Gaza. If we outside Palestine hope for a virtuous cycle of protest and dialogue, we have a duty to make our own contributions, through action as well as talk. Palestinians and Israelis cannot do this on their own. A general boycott of Israeli goods, along the lines of the South African boycott, seems the minimum that is needed. How far should this be extended to cultural spheres like academia, media and the arts? In prioritising an economic boycott, we cannot neglect these areas. A boycott of Israeli institutions is a price they will have to pay to prevent a repeat of what we have seen over the last two weeks – or worse. While contacts with individual academics continue, boycotting conferences in Israel sends a strong message of international disapproval. Stephen Hawking’s refusal to attend a conference hosted by president Shimon Peres worried Israel: its leaders even refrained from inciting accusations of anti-Semitism (usually made against those who boycott the country) against him. The rest of us may not be so lucky, but that too is a small price for standing up. In any case, abuse is weakening the potency of such accusations. Many will say, as I might have said before, that isolating Israel will only reinforce the deep reactionary trends in its politics. This may be true in the short term, but it seems as though only a sharp challenge and dislocation will turn this society and state in a different direction. Israel is radically overplaying its hand locally, regionally and globally by spurning the opportunities for settlement with Palestinian leaders which are on offer. If its present course continues, it is probably only a matter of time before the state experiences a radical shock which will present it with the existential crisis that its leaders’ rhetoric has long invoked to justify its atrocities. Such a shock may come about through the accelerating instability of the wider Middle East, which hardly promises a safe environment for this outpost of the west. It would be better for everyone if it came through western states’ pulling the plug on Israel’s support-mechanisms. Boycotting Israel is not just a way of helping the Palestinians: it could also be the best way to save Israelis from the consequences of their own folly. Thank you for this analysis, may I beg to add further food for thought?. I communicated at length with an Israeli soldier yesterday who portrayed an intransigent paranoia that appears to grip many Jewish people, mirroring successive governments actions since I can remember, which is the early 60s. In his mind, only the destruction of Hamas, will enable a serious peace process to begin. I have sympathy with that and no doubt many abused individuals who have recovered might also understand how an abused people (the holocaust, what could be worse? ), became paranoid and mistrustful. This is not helped today, by the Hamas charter which calls for Israel’s destruction. Lest we forget, Iran was recently of the same conviction and who knows who else? The soldiers relative who was also in the discussion futilely trying to explain why the Israeli action was a disgrace eventually closed the discussion. The soldier had failed to address legitimate argument, batting every question back with wild accusations of western behaviour in this war and that. So for me sir, equal pressure needs to be applied if anything is to get off the ground in a serious manner. Not only must there be sufficient pressure on Israel to talk, equal, perhaps more pressure must be applied to remove barbaric elements of the Hamas charter. Thank you for the post about your change of mind re boycotts in response to Israeli slaughter in Gaza. We would like to reproduce your article in Asian Affairs because we endorse your views. Please confirm if this is okay. Also, can you add asianaffairs@uk2.net to your post list as we find most of your comments are in tune with the magazines stand on the issues in question. 1) if 87% of Israelis supported this war, it’s because more than 1 million Israelis spent the last summer in bomb shelters. By the way, this is also why the number of Israeli civilians killed was so little. 2) in your article, you don’t mention that Hamas was accused by the UN itself, and by many journalists posted in Gaza during the last war, to use civilian infrastructure to attack Israel. By the way, the UN has also acknowledge that most of the civilians killed during the last war were warned by the Israeli army that the buildings in which they found themselves were about to be bombed. Hence, either they were forced by Hamas to stay there or they did it for ideological reasons. 3) Israel offered to lift the blockade provided that Hamas accepts to put the control of the Gaza maritime border under international control. 5) We don’t know what is the real proportion of civilians killed in Gaza since the only numbers we have come from the Gaza health authorities that are controlled by Hamas. However, even these figures are suspect since they show that the proportion of adult male “civilians” who died in this war is disproportionately high. 6) despite that, I’m not denying the fact that Israel’s assault on Gaza was disproportionate although I think that Amos Oz was right to advocate a limited intervention against Hamas. Moreover, I fully oppose yhe blockade, even though it was eased several times since 2010. However, by claiming that Israel killed civilians on purpose, you sound pretty much like those people on the extreme-left who claim that the sanctions against Iraq in the 1990’s killed 500,000 children (which is a lie); or like those people on the far left who supported Milosevic merely because he happened to oppose the West. 7) The purpose of the BDS movement is not a two state solution, but rather the destruction of Israel through the return of Palestinian refugees. 8) Finally, let me remind you that according to most of the polls (except for few of them) that were conducted since 2001, a majority of Israelis agree with the Clinton parameters (1967 border with land swaps). Thus, the reason why the Israeli right us in power is not because Israelis are in favor of the occupation and the colonisation of the West Bank. Actually, according to the polls, around 60% of Israelis believe that the money spent in the development of the settlements should rather be uses in social programs instead. The reason Israelis vote Likud is because they fear, with good reason, that if Israel pulls put of the West Bank, Hamas, which is committed to the destruction of Israel, will use this territory to fire rockets on Israel. And frankly, I don’t understand how you can ignore that. After all, don’t you know that there have been two left wing and one centrist governments, in Israel, since the 1990’s. Why do you think the Israeli left collapsed? Because Israelis decided to go crazy all of a sudden?! The answer is simple: it is called Hamas.